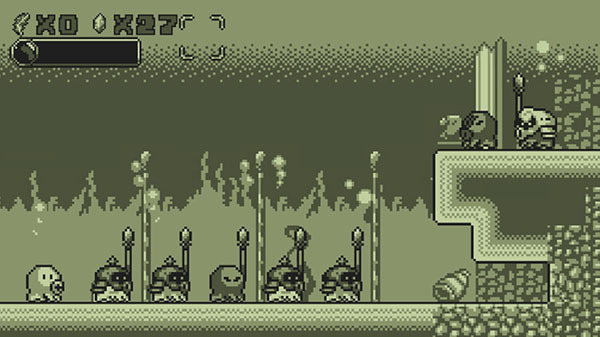 Retro platformer Save me Mr Tako: Tasukete Tako-San will launch for Switch via the Nintendo eShop and PC via Steam on October 30 for $14.99, publisher Nicalis announced. A blast from the portable gaming past! Designed as a tribute to the original Game Boy—looks, sounds and plays like a long-lost cartridge for that beloved handheld game system. 50 different hats that Mr Tako can acquire and wear to gain special abilities. Extensive character dialogue with many unique and memorable NPCs. Side quests, puzzles, mini-games and 16 different dungeons to explore. Multiple player-selectable palettes to change the game’s color scheme.